A daily task that would be particularlyamenable to an autism-specificadaptation is helping children brushtheir teeth. Parents of children withautism often find it helpful to buildstep-by-step routines that the child canfollow to achieve a particular goal.Research has shown that autisticchildren have sensitive gums andteeth. Coupled with the recognitionthat teeth brushing is heavilydependent on internally motivatedadherence to a routine, it isunsurprising that autistic children oftenfind brushing their teeth to be andifficult chore. There is a need for anassistive toothbrush that walks these children through the process of brushing their teeth properly. Such a device must motivate and engage them while in use, and it must minimize discomfort. Research has shown that lights, music, and vibration are helpful stimuli for coaching children with autism. The Specially Equipped Autistic Brush (SEA-Brush) caters to this population of children by integrating all three stimulus types to coach them towards ideal brushing habits. When brushing, SEA-brush users have the choice to play music, lights or vibration/toothbrush automation. Depending on their preferences and sensitivities, individuals may choose to activate all of the features or only a subset. There are two main buttons on the brush—one that gives power to the brush by turning on the lights and vibration, and a second that allows the user to control the vibration intensity. 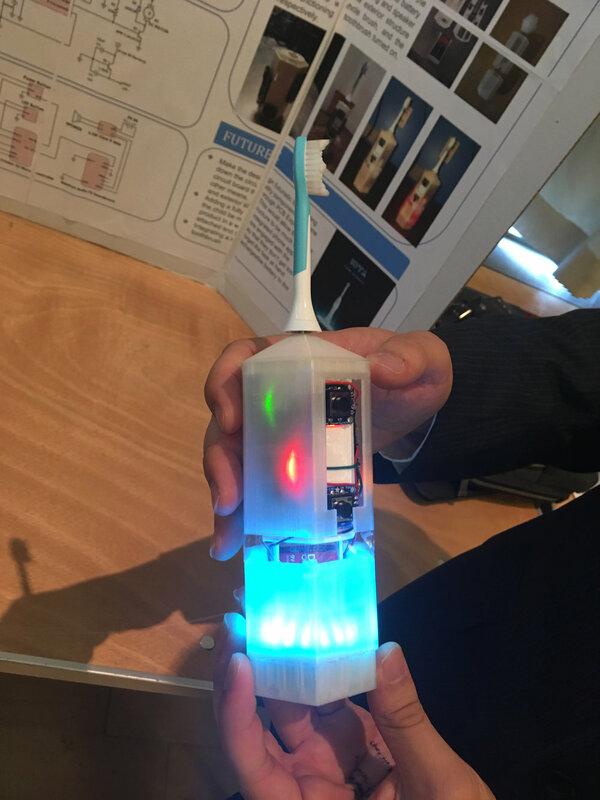 The toothbrush housing transmits the vibration to the user’s hands, which many children with autism find soothing. When the brush is turned on, a melody of children’s songs plays for 2 minutes, the recommended brushing time. When they stop playing, the child knows he or she has successfully completed the routine. The SEA-brush is an effective intervention for families supporting a child with autism who is working to learn a routine conducive to healthy brushing habits. Go Baby Go, a project framework that aims to make powered mobility accessible for young children with motordeficits, was initially started by Dr. Cole Galloway atthe University of Delaware. Children with mobility disabilities are often denied the formational experiences of socializing with peers and exploring new environments. Go Baby Go hopes to minimize the disadvantages introduced by mobility disabilities, helping young children to socialize near-normally and to move independently. In this implementation of Go Baby Go, we are customizing a ride-on car for a 5 year-old boy who manages cerebral palsy and legal blindness with the help of his family. To customize a ride-on car for this child’s individual needs, the team implemented an alternative steering mechanism that transfers control to a supervisor. Additional safety features, including a headrest and five-point harness, were added to secure the child while he is in motion. Finally, the car was rewired so that a button on the steering wheel activates the car instead of the factory-default foot pedals. Children with visual deficits encounter fewer opportunities for sensory stimulation, which necessitates that they rely on alternative sensory input and training to improve their motor abilities. Prior studies have indicated that a Sensory Substitution Device (SSD), designed to stimulate other senses in the absence of vision, yields improvement in sensory integration and motor functioning when deployed as a therapeutic intervention. Clinicians at the For His Children orphanage in Ecuador requested a device that would enhance the diversity of sensory experiences for children at the center. After a previous Enabling Engineering group delivered a prototype in March 2015, the staff in Ecuador requested a second iteration designed to be more durable. The second iteration of the Sensory Cube prototype adopted many of the first team’s design decisions, keeping to similar sensory stimulation strategies across the various faces of the cube. On one face, however, this year’s team integrated electronic components, which the first iteration did not include. With the addition of LEDs for seeing users, a small speaker, and a microcontroller to drive the electronic components, one face of the cube offers novel sensory experiences for the children. By relying on different materials and construction strategies, the second iteration of the Sensory Cube project is more structurally sound—the team expects it to withstand its high energy environment more capably over time. This project is complete and a prototype was delivered to the orphanage in Ecuador in March 2017. Three blind children at an orphanage in Ecuador use the walls as guides to navigate within and between rooms. The goal of this project is to create fixtures that provide diverse types of tactile stimulation and allow the children to differentiate between rooms. As the team designs these fixtures, they will be working towards two objectives: first, to help the children clearly differentiate between rooms using recognizable textures, and second, to introduce a new source of sensory stimulation to the daily lives of these children. Sensory stimulation is critical for normal brain development in all children, and with the absence of visual stimulus, tactile stimulation promotes healthy development for these children. The Sensory Strips prototype takes theform of a guide that attaches to a wall,allowing blind children to exerciseindependence as they navigate their environment. Using PVC pipes that trailthe wall’s length and panels featuring descriptive, tactile symbols, the childrenare able to walk independently andidentify their location within the room and building. Though simple, this has provento be an effective solution that introduces detectably increased independence inthe lives of the blind children at For His Children. An 18 year-old managing cerebral palsy (CP) relies on an application and a physical switch for communication. As is common for accessibility software, this communication application uses a scanning strategy to collect user input — it highlights menu options in the user interface one-by-one, row by row, until the switch is activated to select an option. A consequence of scanning strategies is that making a selection can take a very long time if the desired item is one of the last to be scanned. This teenager needs a faster, more flexible way to interact with his existing communication software. The Speakeasy solution draws fromanother Enabling Engineering projectdesigned for the same individual—X-MAXGame Controller. After receiving feedbackfrom the family and the school’s physicaltherapist, it was clear that they wereinterested in using the X-MAX prototype tointerface with technology other than anXbox. Speakeasy represents the firstapplication of the X-MAX hardware to acontext that is unrelated to gaming. SinceX-MAX emulates an Xbox controller,interfacing with the communication software involves running an application that enables cursor control by an interface device that isn’t a mouse or trackpad. Now, instead of relying on a scanning input strategy, the menu options can be navigated using the X-MAX buttons like arrow keys. Has been tested on a regular Xbox 360 controller, and needs to be tested using the X-MAX controller. A four-year-old who has nonverbalautism and impaired vision,requires a device for auditorycommunication that is durable,effective, and wearable. The aidesat the For His Children orphanagereport that Hector is unable toverbalize his basic wants or needs,such as “I need to go to thebathroom,” or, “I want to go outside.”The child needs a solution that allows him to convey basic information about his current state quickly and easily. Since sensory stimulation can greatly benefit children with autism, a secondary objective was to provide sensory stimulation through the device. Given his rough-and-tumble personality, it is important that any intervention be sturdy and waterproof. In collaboration with the NU Physical Therapy department, the team created a pouch that attaches to an autism pressure vest that the child was known to wear. Touch-sensitive plates were placed in this pouch and wired to an Arduino and speaker, which were housed in a pack connecting to his belt. The device fulfilled its primary objective by allowing any user to communicate six different messages using six different buttons. The device’s use will be monitored by the Physical Therapy department at Northeastern University, which receives usage data recorded and sent by the vest’s Arduino. At the William E. Carter Schoolof Boston, students withcerebral palsy (CP) lack boththe fine motor skills needed toactivate mechanical switchesand the ability to communicateverbally. There is a need for anergonomic, wearable, vocalvibration-activated switch toextend the ability tocommunicate and learn withclassroom devices to studentsmanaging CP. Currently, many devices are only accessible via mechanical means. A vocally-activated switch will provide more students access to the communication, education, and leisure afforded by existing classroom devices. The team is developing a switch activated and controlled by the vocal cord vibrations of the user. The device will use a MEMS accelerometer to measure vocal cord vibrations. These signals will then be digitally filtered through a microcontroller using the Fast Fourier Transform (FFT), providing the ability to distinguish intentional vibrations from unintentional noises to promote accurate switch activation. The end product will be designed to act in place of existing mechanical switches and interface with educational devices currently used in the classroom setting. 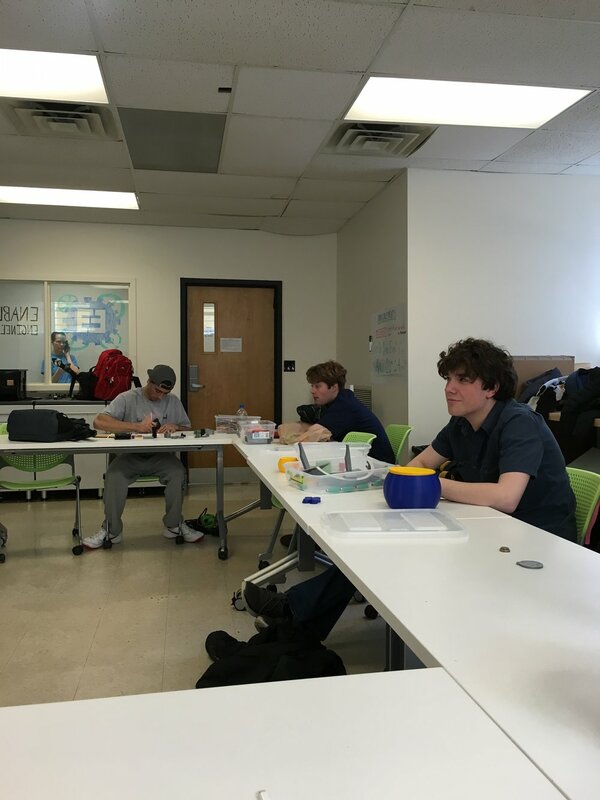 The main activities have been learning about how the accelerometer works, figuring out how to gather data in MATLAB, and designing a holder to house the electronics in a wearable, comfortable, ergonomic fashion. A 17-year-old girl who manages spastic cerebral palsy spends most of her time in a wheelchair. Wheelchair users experience muscle atrophy if they are unable to exercise and bear weight on their limbs. Doctors recommend an hour of exercise daily to prevent muscle degradation. Unfortunately, traditional walkers have painful pressure points, which discourage the girl from walking. She also disliked the attention that traditional walkers draw, which led her to ask for an alternative that attracts minimal attention and affords increased maneuverability. Her ideal walker will feel comfortable, be inconspicuous, and impart a sense of security and control in use. To fulfill the goal of giving Diana a walking system that keeps her stable and comfortable while bearing part of her body weight, the team modified a walker that Diana had tested and found more usable than most. The team designed a frame out of aluminum extrusions, which suspends a custom harness that supports Diana, and integrated the frame into the gait trainer. It is fully adjustable. Replacement components, particularly within the front wheels of the walker, were designed, machined, and integrated to ensure greater structural stability alongside the modifications. This new, better fitting harness gives Diana the sensation of walking, the health benefits of bearing her body weight, and less discomfort during use. This project is complete and the prototype is being delivered to the client. An 18-year old boy has cerebral palsy and uses a wheelchair to move around. His upper body movement is limited, and he speaks with the help of assistive technology. He enjoys playing video games, but currently he can only play with the help of an adult. The goal of this project is to develop a system that allows him to play video games independently. The selected design mimics an Xbox 360 controller with an adjustablecontroller system. There are left andright joysticks that are separate from the rest of the controller, eachlarge enough to be manipulated bya full hand without fine motor controlin the fingers. A switch mechanism, located on the wheelchair’s headsupport, replaces the four maincontroller buttons. He controls itwith his head. 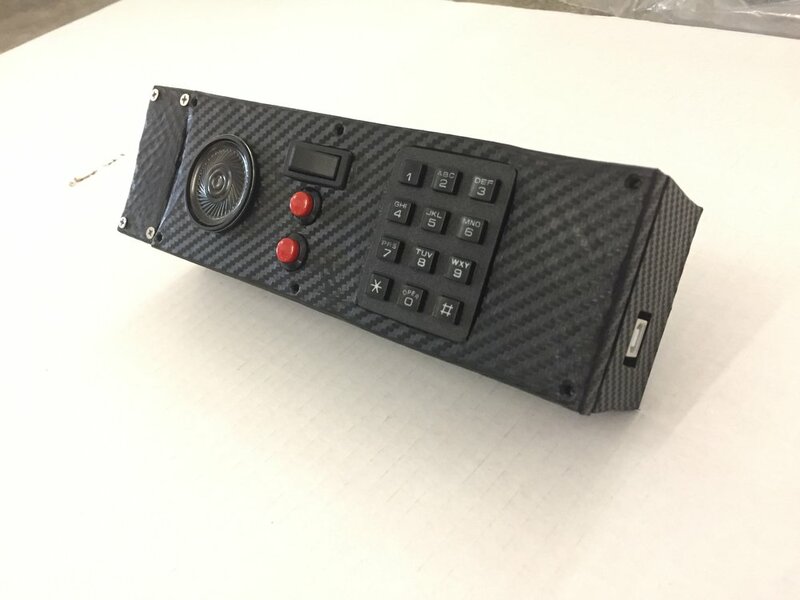 Recently, the early prototype was improved by theaddition of a frame that is more rigidand adjustable, leaving the device better- suited to future modifications and making fine adjustments. This design is much cheaper to produce than existing solutions and more comfortable for users. In many special educationenvironments, educators workto impart life skills that theirstudents can later useproductively in the workforce.With the advent of rapidprototyping and 3D printing, twoteachers at the South ShoreEducational Collaborative (SSEC) sought to explore the feasibility of teaching their high school students 3D design and printing skills. In a collaboration with Enabling Engineering, SSEC was awarded a grant from the State of Massachusetts to teach students the principles and concrete skills underlying rapid prototyping. This endeavor is distinct from all other Enabling Engineering projects in that it is an initiative with an explicitly education-based goal. In collaboration with SSEC, EnablingEngineering developed a curriculum toteach high school students basic CADand 3D printing skills. Thiscollaboration entails monthly meetingsthat are planned and run byrepresentatives from both Enablingand SSEC. The initial meetings, whichtook place monthly during the fall of2016, have focused on teaching thestudents how 3D printers work, how tocreate basic CAD models, and how touse those models to print. Eachmeeting functions like a workshop,providing students an opportunity tolearn about 3D design and 3D printing in a hands-on environment with access to experienced mechanical engineering students. The students recently completed prototypes of devices that they conceived, modeled, and printed independently. This project is an ongoing collaboration with SSEC students. Children with physical and/or developmental disabilities participate in physical therapy (PT) and occupational therapy (OT) activity programs over extended periods of time to learn new skills and maintain strength and range of motion. The biggest factor predicting rehabilitation success is the amount of time spent practicing, but children find it challenging to adhere to boring activity programs. Lack of practice leads to functional deterioration and reduced quality of life. Using technologies such as virtual reality (VR) gaming systems in rehabilitation motivates children to enhance practice dosage. However, many VR systems are expensive and inaccessible to young children or those with significant disabilities. The FITBoard (Fun Interactive Therapy Board) is a rehabilitation tool consisting of a tablet and boards with touch keys that parents can configure in different ways. Toys and other inter faces are attached to the keys to control sounds, videos, or games. The FITBoard will motivate children to engage in repetitive practice of functional head, body, arm or leg movements, depending on its configuration. The team is now evaluating FITBoard’s usability among a sample of children, parents, and therapists in two rehabilitation settings. The team will assess users’ interaction with the FITBoard and evaluate factors that may impede or facilitate its use in rehabilitation. The team’s findings will inform future research. Ultimately, the FITBoard can be integrated into interventions to increase practice dosage, enhance outcomes and improve quality of life for children with disabilities. This project is in the clinical testing phase. A student at the South Shore EducationalCollaborative (SSEC) uses a Tobii device thathelps her communicate. When she sits at adesk, her Tobii needs to be mounted near her.Julia’s current desk mount is not tall enough tohold the Tobii at an optimal height, and itsheight isn’t adjustable. In order to serve Julia’sneeds, an effective mount must effectively holdthe weight and shape of the Tobii, and it shouldallow for height adjustments. Similarly, Julia alsoneeds a screen guard for the device. As is to be expected, she touches the screen frequently. Unfortunately, this has proven problematic since it often results in accidental closures of her communication software. This protective cover must be easy to remove so that those assisting Julia can easily use the touch screen when necessary. The team divided the project into two sections. One section is focusing on constructing a custom desk mount for Julia’s Tobii, and the other section is pursuing a plexiglass cover for the Tobii’s screen. For the mount, the team began by developing two design concepts to prototype. In concert with Julia’s aids at school, the team will assess each concept prototype to determine if either is a sufficient, effective, and sustainable solution to Julia’s Tobii-mounting problems. For the plexiglass cover, the team began by developing a set of requirements: (1) it should not cover the cameras or the sensors behind the screen, and (2) the cover should be easily removed and attached for the convenience of the people assisting Julia. The design concept features straps, which fix the screen in place, that connect to the backside of the Tobii. The screen guard is currently finished and the team is close to finishing the adjustable stand. After visiting The Carter School and seeing effortsmade by a previous group, the team elected tobuild a communication cube that represents core vocabulary words that the students normallyencounter in everyday interactions. By serving asa physical symbol of thoughts the students wish to express, the cube allows the students to point atwords as they learn to vocalize, touch the objectsto gain a tactile association for the words, and seethe visual representations of each word. 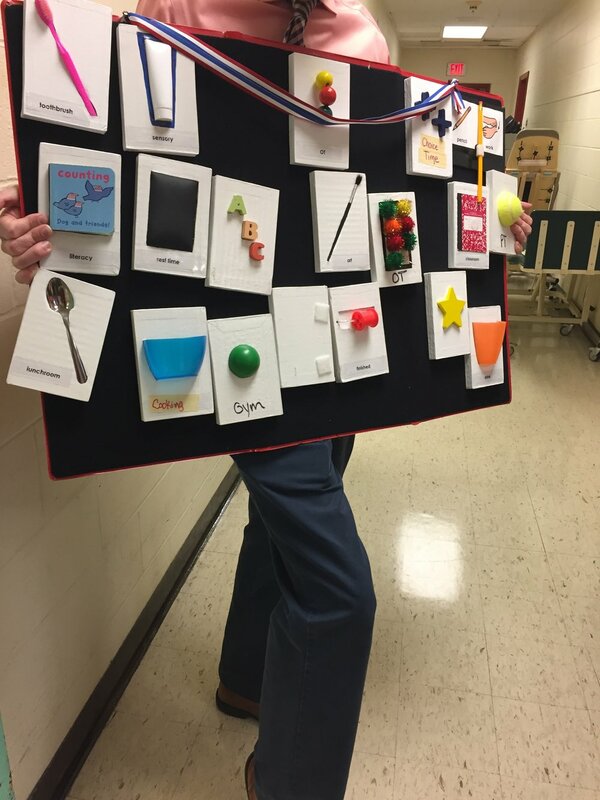 This multi- sensory approach is expected to improve their rates of core vocabulary comprehension. The team employed 3D printing as a strategy for quickly prototyping cubes with various objects raised off of each face. Initially, these objects have consisted primarily of emoji, depicting facial expressions and emotions. While many of the students are unable to vocalize their feelings and desires, they still have them, and they often wish to share them. By relying upon their existing understandings of emotion and facial expressions, the communication cube serves as an entry point for students attempting to learn new word associations. With the addition of more cubes in the future, The Carter School hopes to build a set of themed cubes, such that each object on the cube faces will be related. The cube- specific relationships will further encourage the development of a fluid, relational vocabulary. A collection of communication cubes were developed. The project team is working with the Carter School to develop revised cubes. Blindness is a common impairment across the United States and the World. Across the populations of individuals with either severe visual disabilities or total blindness, many people require assistive tools to compensate for profound visual impairments. Most assistive devices address the many day-to-day living constraints introduced by visual impairments. Unfortunately, this leaves blind people who hope to participate in visually-demanding hobbies at a loss. Very few tools are designed to enable blind people to participate in specialized careers or hobbies. This project focuses on one example of such a hobby: woodworking. Woodworking involves many tasks suited to visual acuity, but one of the most common woodworking tasks is using a level. Unlike so many woodworking tools, conventional levels are impossible to use without sight, not simply difficult to use. For blind people with a desire to take up woodworking, there is a pressing need for a level that has been designed for their needs. The team built an electronic leveling tool that relies solely on tactile and auditory sensation for operation. Users interact with the device through instructional braille audio outputs. While maintaining a simple and straightforward user interface, this interpretation of a level can still be relied upon to provide highly accurate results. In use, the level offers three modes of operation. First – and by default – it provides an auditory cue upon reaching the standard angles of 0° and 90°. The second mode allows the user to hear the current angle of the level, whatever it may be. The last mode accepts a specific angle from the user via keypad, and when the level reaches the target angle, a beep notifies the user. 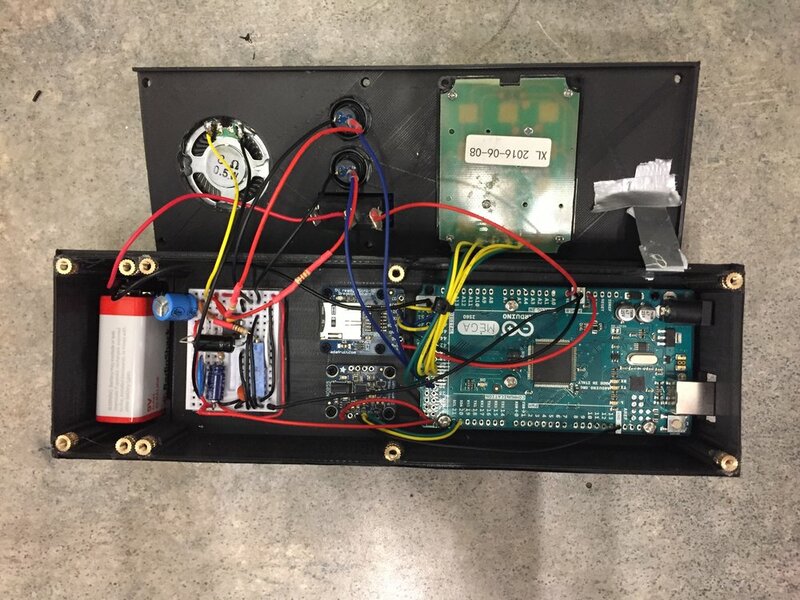 To achieve this, the device’s circuit consists of an Arduino Pro microcontroller, a gyroscope chip that detects the level angle, and a keypad for entering target angles. This device constitutes a novel blind-assistive tool. It appeals to the sightless artisan community, and within that community, the team hopes it will spur further growth and development. Researchers Sari Altschuler and David Weimerare working to explore and publicize artifactsthat demonstrate the history of communicationwith the blind. Before the development andpromulgation of Braille as an improved methodof conveying information through tactilesenses, the most common strategy for makinginformation accessible to blind individualsinvolved translating a normal page into a 3Dversion of itself. Wherever there was ink, therewas a smooth bump detectable to fingers. Tobring such artifacts to the public, Altschuler andWeimer are developing popup exhibits featuring3D printed versions of the artifacts found in the Perkins School’s archives. Ultimately, institutions and museums across the country will be able to host their own exhibits by downloading a set of files and reproducing the artifacts in printed form. Enabling Engineering offeredtechnical assistance to developprinting methodologies and createdigital representations of theartifacts. To be able to print replicasof the Perkins School’s artifacts, theteam needed to capture the artifacts’physical intricacies in STL files—themost common format for 3D printing.After finding that 3D scanning wouldbe an inadequate solution due tolimitations of the technology, the remaining options included creating an STL file using a 2D image or modeling each artifact by hand using CAD software. Given the scope of this project and the artifacts relative inaccessibility, the team chose the first option and developed an image processing algorithm in MATLAB that generates an STL file from an image of each artifact. The algorithm goes through any given image pixel-by-pixel, assigning each a specific height value depending on its grayscale color. 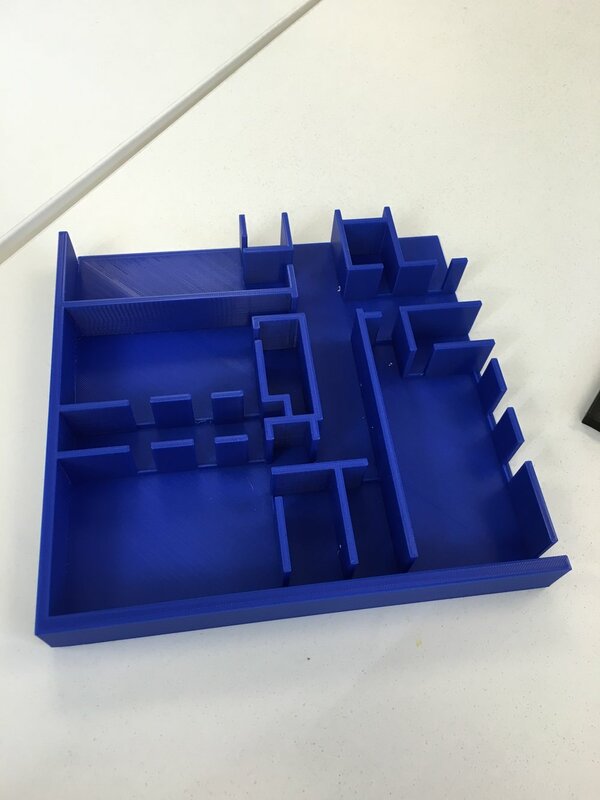 The methodology to print the artifacts has been developed and a collection of artifacts has been printed. A grant proposal to support this project was submitted. Many children with severe physical disabilities cannot move around when they are young, denying them any chance to develop visual- spatial skills. Thus, by the time they do become mobile by way of a power wheelchair, they are able to see obstacles, but they are unable to accurately judge their proximity to the obstacles to determine when they should apply the breaks. This population would benefit from a device that warns them – and if necessary, applies the brakes for them automatically – when nearing obstacles. Experimental projects have incorporated collision-avoidance as a component of power wheelchair systems using a variety of sensors; however, these projects have focused on elderly end users, a population whose primary needs were addressed by a solution designed for indoor use. 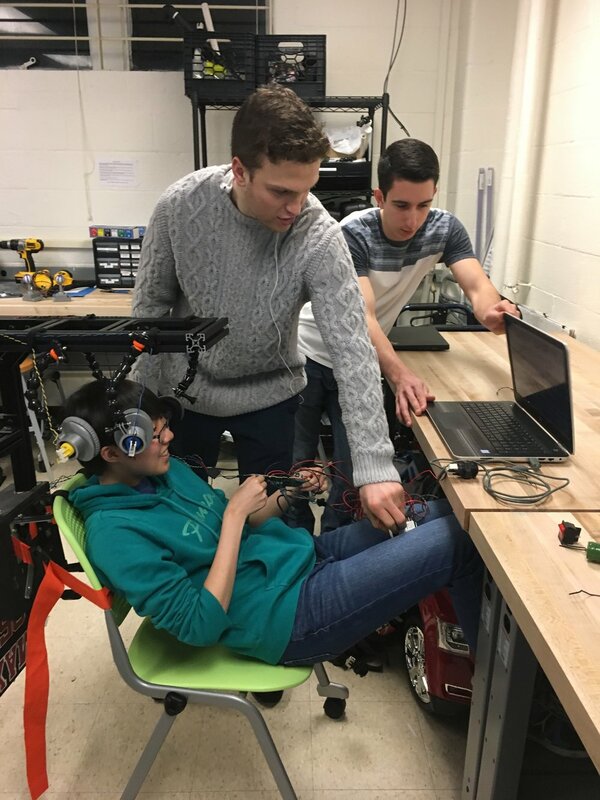 This project addresses the need for a collision-avoidance power wheelchair that is cost effective, user- friendly, and designed for use indoors and outdoors. The Aware-Chair is a power wheelchair that allows a user to navigate through various environments without fear of collisions with people, walls, or miscellaneous objects. The wheelchair operates by monitoring the distance to nearby obstacles that could lead to a collision. If the user steers too close to an obstacle, the wheelchair slows in response, offering the user an opportunity to navigate away from the obstacle independently. This is referred to as the slow zone. If the user moves away from the obstacle, the wheelchair exits the slow zone and returns to operating as it normally would. In the slow zone, the velocity in the direction of the obstacle decreases as a function of time. If the user ends up getting too close to the obstacle, the wheelchair enters the stopping zone, at which point the user can no longer navigate towards the obstacle at any speed. Upon rotating the wheelchair to move away from the obstacle, the wheelchair reenters the slow zone, and ultimately, returns to regular functionality. This project is complete and was demonstrated to a prospective client. 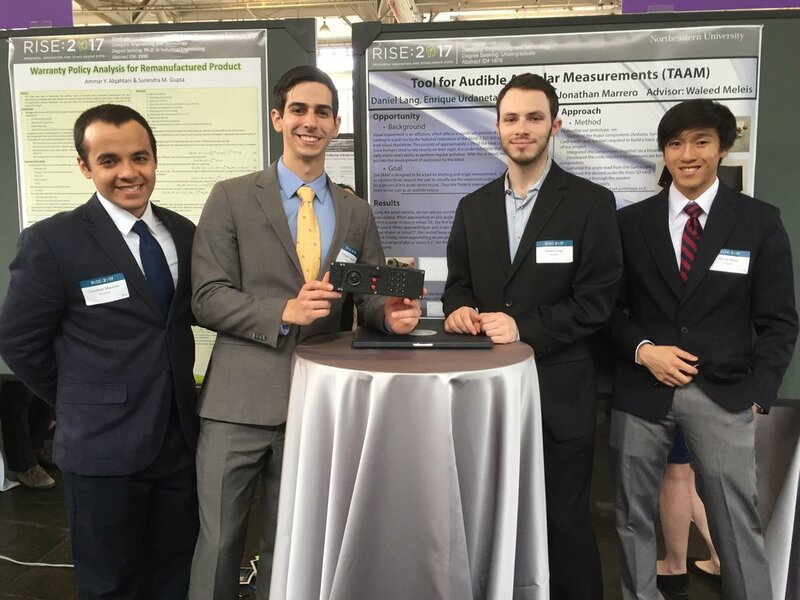 This project won a second-place prize in the 2017 ECE Capstone Competition.